We were privileged to be invited to spend International Children’s Day at one of our favourite centres, King George VI Rehabilitation Centre, here in Bulawayo, Zimbabwe. 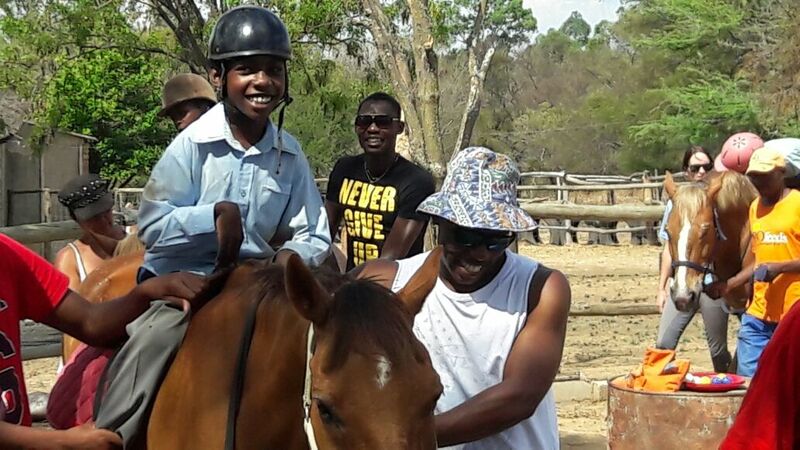 We have been working with the dedicated staff, and amazing children from KGVI since early 2014, almost at the start of Healing with Horses Zimbabwe. KGVI has the same basic ethos as Healing with Horses, to encourage independence in the children we serve and to create awareness amongst communities of the right of every member to be active and present within the community. This enabled us to accept an invitation from Skyz Metro FM, a Bulawayo Radio Station, to join them at KGVI to celebrate International Children’s Day, with great pleasure and honour. What a privilege to see all our friends at KGVI, the staff, children, and even Mrs Hussey, on this important day of the year. Also present at this celebration was Childline, and Reaching Out Charity Organisation, and it was a wonderful opportunity to meet with these organisations who all have the children of Zimbabwe’s welfare at the centre of their organisations. Thank you to Skyz Metro FM for extending this invitation to Healing with Horses. Healing with Horses works with children on an hourly basis, and it was inspiring to hear the Childline Representative, Doris, discuss the 54 rights of children, and to realise that, here at Healing with Horses we serve, or have the means to serve, children, who have had most of these rights violated, and to help these children to come to terms with these violations, and to regain the self-worth and the courage to live through and past these violations, and to re gain their rightful place in the community. It was also interesting to listen to the representative from Reaching out Charity Organisation. We look forward to working together with some of the members of this Charity who will be visiting us in the next week to see what we do, and to possibly volunteer during our group sessions. Everyone involved with our Healing with Horses Family knows how challenging working as a volunteer here at Healing with Horses is, but also how it touches your heart and fills your life, and how, once these children have come into your life, you can’t imagine how you ever got on without them. We are always short of volunteers, and welcome everyone who has the desire to join us here and help us to change children’s lives. There are hundreds of ways in which you can become a part of our family and make a difference to these children. Please contact us, healingwithhorseszimbabwe@gmail.com, to find out how you can become a part of this amazing organisation. The highlight of our visit was to see our special friend Jonah, who, lives every minute of his life to the full and brings such joy and light to the staff, ponies and volunteers at Healing with Horses, celebrating International Children’s Day by dancing his heart out with his friends! Thank you to Jonah and all the other incredibly special children we serve here at Healing with Horses for filling our lives with joy. Healing with Horses is a PATH Intl. Therapeutic Centre located in Bulawayo, Zimbabwe.